Gertrude Atherton, née Gertrude Franklin Horn, was born in San Francisco, California. Her parents separated when she was two years old and she was raised by her maternal grandfather, Stephen Franklin, a relative of Benjamin Franklin, on his ranch near San Jose. She went to high school at St. Mary's Hall in Benicia, California, and briefly attended the Sayre School in Lexington, Kentucky. In 1876, after returning from Kentucky, she met and eloped with George H.B. Atherton, who had been courting her divorced mother. She went to live with him on his estate at Fair Oaks, California (now the town of Atherton), where she began writing, despite his opposition. 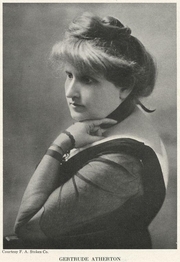 Her first novel, The Randolphs of Redwoods, was published under a pseudonym in serial form in the San Francisco Argonaut in 1882, and later appeared in book form as A Daughter of the Vine (1899.) In 1887, her husband died at sea, leaving Gertrude free but with a daughter to support. She traveled to New York City and then to England and Europe, producing more than 40 novels in rapid succession. Many of them featured strong heroines and dealt with feminist issues. Her works included The Conqueror (1902), a fictionalized biography of Alexander Hamilton, and her biggest success, the semi-autobiographical Black Oxen (1923). It was adapted into a silent film. She also wrote numerous popular books on the history and culture of Spanish California as well as freelance articles for The New York World, book reviews for Vanity Fair, and short stories. She wrote several stories of supernatural horror, including the often-anthologized "The Striding Place." She also wrote two volumes of memoir/autobiography, Adventures of a Novelist (1932) and My San Francisco: A Wayward Biography (1946). Gertrude Atherton is currently considered a "single author." If one or more works are by a distinct, homonymous authors, go ahead and split the author. Gertrude Atherton is composed of 8 names. You can examine and separate out names.